Stephanie Lindquist, Beth Jackson, Jill Sampson & Donna Davis. This photo was taken a couple of days after Bimblebox: art – science – nature opened at Redland Art Gallery. These are the women who worked extremely hard to bring this comprehensive and diverse exhibition about the Bimblebox Nature Refuge to Redland Art Gallery and developed it into a National touring exhibition. 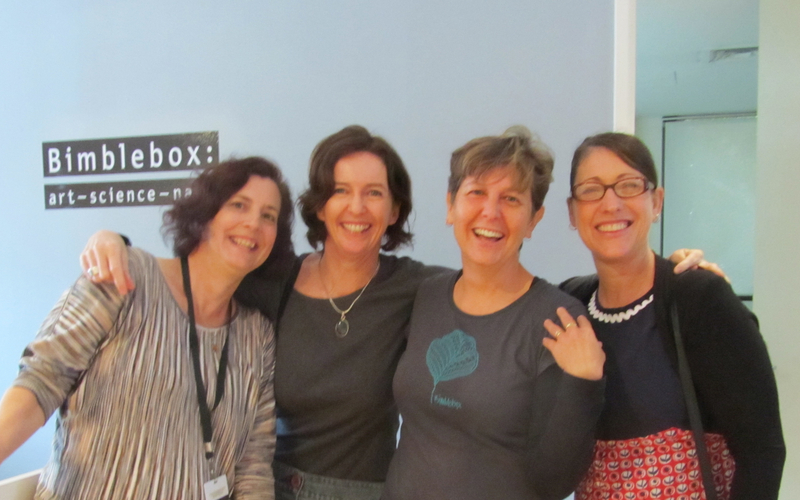 L to R: Stephanie Lindquist Director of Redland Art Gallery, Beth Jackson Curator of Bimblebox: art – science – nature and Director of Artfully, Jill Sampson Coordinator of Bimblebox Art Project, Donna Davis Exhibitions Development Coordinator at Museum and Gallery Services Queensland. Thank you ladies for your professionalism, combined skills and commitment to this project. One more week to see Bimblebox: art – science – nature at Redland Art Gallery. The Awesome Foursome!!! Well done ladies and a heartfelt thank you from all lovers of nature. Beautiful! Finally got here to see your smiling faces! Thank you thank you thank you!